NAFTA. The WTO. Trade agreements are supposed to benefit us all. Instead, in the decade since they’ve been in effect, life has become much worse for millions of working Americans. 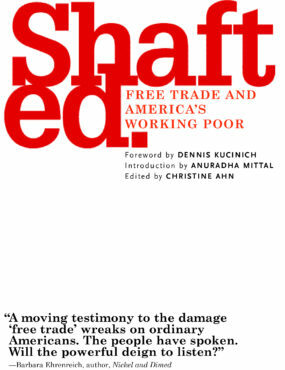 In Shafted, working people-family farmers and farmworkers, fishermen and seamstresses-describe the ruin free trade has brought to them, their families, and their towns. These aren’t theorists; these are the voices of experience. And they’re telling us, clearly and eloquently, that it’s time to stop the madness that enriches a few corporations at the cost of justice, human rights, community, family, and the dignity of work and of workers. Download the Foreword by Dennis Kucinich. Download the Preface by Christine Ahn.